My first full week of being back on Weight Watchers went really well! I haven't felt this kind of determination in about two years. It all started when I was looking through my old pictures and blog posts from early 2013 (when I was running my fastest, and was at my goal weight) which gave me motivation to get started. But I've written several times that motivation is only temporary--it's determination that will get me to my goal. I haven't felt true determination in a long time. It feels good! Having done intuitive eating for the past couple of months really helped me out this week in getting back to counting points. I ate what I really wanted, and I wasn't afraid to spend extra points here and there for things I used to avoid on Weight Watchers (real butter, for example--I've been loving sourdough toast with real butter for breakfast, and before intuitive eating, I would never have wanted to spend 3 PointsPlus on butter!). I also didn't hoard my points for a big dessert after my long run because I realized, through intuitive eating, that I really don't enjoy them as much as I thought I did. If I'm really craving a big dessert, I'll have one, but I'm not going to plan for it each week like I used to. 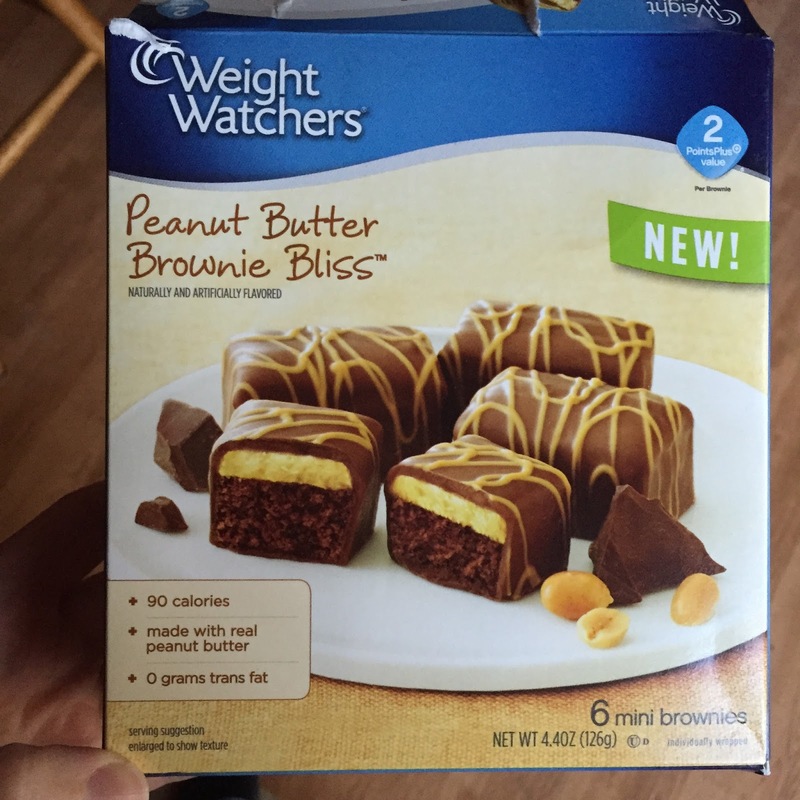 I've been having a Weight Watchers peanut butter brownie for dessert every day (2 PointsPlus). I'm not crazy about most of the WW foods, but those peanut butter brownies are AMAZING. I dare say I like them even better than the Mrs. Fields Dream Bars, which are 18 PP each. I'm still paying attention to whether I'm hungry or not, and I stop eating when I'm satisfied, even if it means leaving some food on the plate. Intuitive eating taught me that it really doesn't take a big meal to satisfy me, so I make sure to pay attention to that while counting points. Just because I count the points for something doesn't mean I have to eat the whole thing. I'm not planning to weigh myself until November 1st. I can tell I've lost weight, but I'm afraid if the number isn't what I'm imagining, then it'll feel discouraging. In 2012, when I started WW, I didn't weigh myself for a few weeks, and I liked it that way. Anyway, the jeans I just bought last month are too big, and I was able to tighten my belt a notch, so I know it's working. And then on Thursday, I leave for Pennsylvania for the Runner's World Half & Festival. I've been looking forward to this for months! Thursday and Friday will be spent doing blogger stuff (I'm not sure exactly what that will be yet), and then I'll run the 5K & 10K on Saturday morning. After a couple of seminars on Saturday, I'll head back to the airport and get home Saturday night. Sunday is the Detroit Free Press Marathon, which my brother is running and I'll be spectating. I've been getting prepared for that for weeks now (I take cheerleading very seriously at races!) and I'm really excited to go do that. After the race, we are going out for pizza and then for drinks, at Nathan's request. Tomorrow, my friend Sarah and her husband Ne are coming over to visit. And on Friday, my brother's girlfriend, Kendall, is coming over for lunch and to make some signs for the race. So with all of these things coming up, I'm going to have to do some careful planning as far as spreading out my points. I think I may try and do my long run tomorrow (10 miles), because that will give me a lot of extra points to work with. I keep seeing ads for the brownies, but I haven't found them. Where did you buy them? I bought them at Kroger. They were in the bread aisle, on the shelf with the packaged doughnuts and other baked goods. They're pricey, but worth it! How do you determine how many extra points you get for your running? With Points Plus using carbs, fats, etc to calculate points, I'm finding it hard. I do wear a heart monitor with my Garmin, so I know how many calories I burn. Do you know how many calories per point? I've been using the WW e-tools app, which calculates the Activity PointsPlus for me, but I used to use a simple formula--take your calories burned, and divide by 80, then round UP to the next whole number, and that will be the points earned. I've found that to be more accurate, because when you work harder, you earn more. Busy schedule, girlie! Well done on recommitting to your plan. Sometimes you need a break to reset (intuitive eating) and then you can go back to what works for you (points!). I'm really glad that I tried the intuitive eating! I learned so much about myself that has helped out with WW. I am on WW now and I have to say, preparing for big events is hard! I know you will get it, though! I'm planning on spectating next Sunday, too! I did it a few years back when a friend ran and it was one of the most inspiring things!